Me and Mine: Where does the time go? 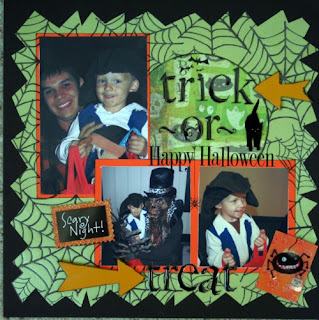 Trick-or-Treat is a layout that I did for the scraplift challenge of one of Sara's layouts. I love the texture of this one and the jagged edges is great for a Halloween page. 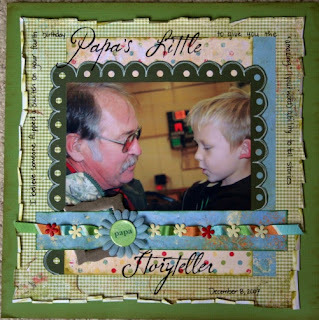 Papa's Little Storyteller is in honor of the fact that Gabe never shuts up from the time he wakes up until the time he goes to bed. I love him to death but boy can he talk and tell some tall tales!! 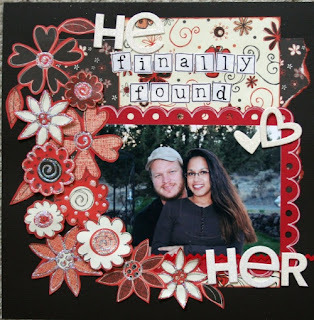 This layout was created for the "Use Your Metal Stash" challenge. This is one of those funny pics I took of Karl at Thanksgiving. He and Gabe have so much fun together. 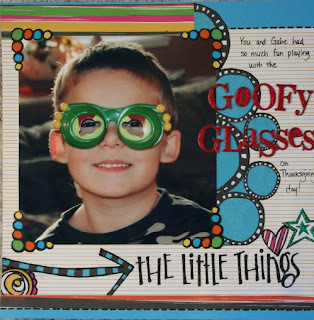 This challenge was the "Manufacturer's Challenge" using Reminisce products. I've done a bunch more but here are the last two I'm going to post. 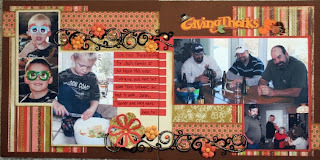 One is of Carie and Jason and the other is the 2-pager I did of Thanksgiving at our house. The Thanksgiving page was for the January Sketch Challenge. Both are fun.